This section is from the book "Colonial Furniture In America", by Luke Vincent Lockwood. Also available from Amazon: Colonial Furniture In America. 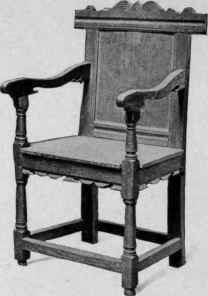 The second style of chair found prior to 1650 is the oak chair known as the wainscot chair. The word "wainscot" is derived from the Dutch "wagen-schot," literally a wagon partition, referring to the best oak timber, well grained and without knots, such as was used in the best coaches of the period. These chairs were much more massively built than the turned chairs, the construction being the same as was found on the oak chests and cupboards of the period. The backs were framed and panelled, and all joints were mortised and tenoned, fastened with draw-bore pins, and the legs were heavily underbraced. 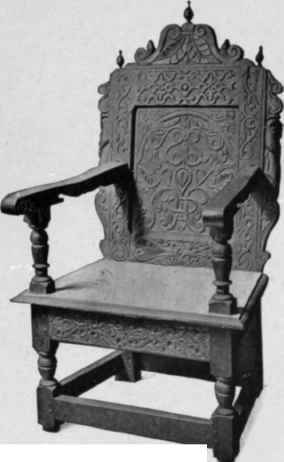 The seats were of oak slabs and were made more comfortable with cushions, which were frequently mentioned in the inventories in connection with the chairs, as in Salem, in 1644, "2 cheares & two cushans"; also the following entries refer to these chairs: Plymouth, 1634, "a joyned chair"; 1682, "a chair and cushion"; at New York, 1691, "7 chairs and four old cushions"; at Philadelphia, 1694, "4 framed oak chairs and cushions"; 1695, "large oak arm chair and cushion"; at Providence, 1712, "a great chair and 2 cushions"; 1727, "2 cushons for grate chear"; 1730, "a greate cheiar and quoshen"; at Yorktown, Virginia, 1658, "2 wainscoate chairs"; 1659, "3 wain-scoate chairs." They are also frequently referred to as wooden chairs. 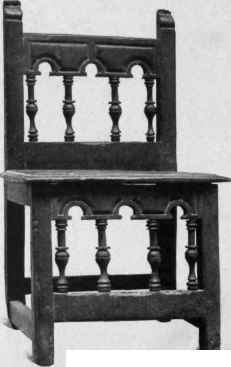 Turned Slat-Back Chair with cabriole legs, Pennsylvania type, 1725-50. There is mention of the wainscot chairs in the English inventories in the sixteenth and seventeenth centuries, and they were probably more generally used there than here, comparatively few being mentioned in the New England inventories, although a fairly large number are mentioned in those of the South. They are valued at from two to three times as much as the turned chairs, which undoubtedly accounts for this fact. The chairs, when carved, show the same designs as the chests and cupboards of the period. Figure 431. 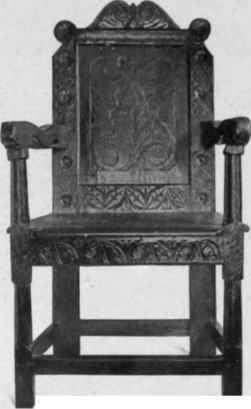 Carved Oak Wainscot Chair, about 1600. A massive wainscot chair which is at the Essex Institute, Salem, is shown in Figure 431. The cresting is composed of two S scrolls with foliation between, and three turned finials finish the top. The upper rail of the panel is carved in an arabesque design, and the stiles are in a foliated scroll design and the lower rail is in a double-foliated scroll. The panel is in a design of leaves, flowers, and scrolls, and it will be interesting to compare this panel with the centre panel in the chest shown in Figure 8, for it is the same theme worked out a little differently. On either side of the stiles are applied carvings and scroll designs. It is rather unusual for the top rail to set inside the stiles; the construction usually is the other way, the stiles setting into the rails. Figure 432. Carved Oak Wainscot Chair, first quarter seventeenth century. 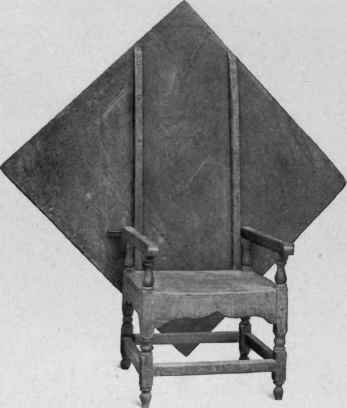 Figure 432 shows a chair which tradition says was brought to America in 1660 but belongs to an earlier date. It will be noted that the front feet are not turned but are cut on the square in a turned design. The upper panel is in the familiar double-scroll design, and on the lower rail of the panel is carved a lunette design. The cresting extends over the stiles and is carved in two arched designs in different planes. An applied ornament of wood undoubtedly originally finished the space under the projections of the top rail, as in Figure 437. Figure 433. 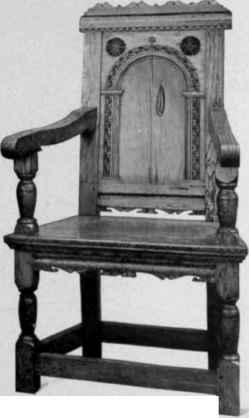 Oak Wainscot Chair, first quarter seventeenth century. Figure 434. Child's Wainscot Chair, first quarter seventeenth century. Figure 433 is supposed to have been made at Cheapside, London, in 1614, and to have been used by Governor Winslow in his council chamber in 1633. The top rail is crested in a scroll design and a grooving on the rails is the only ornament. The skirt is cut on an angle to give the appearance of flaring and is serrated in a design found on many chests and tables of the period, and an applied ornament of wood probably finished the sides under the projecting top rail. An interesting child's chair from the Bolles Collection is shown in Figure 434. The back is low and the top rail is cut in three arches, and four spindles connect these with the rail. The same theme is repeated in the front below the seat. The stiles extend high above the rail on either side in the manner that was popular in the Italian and Flemish schools. Figure 435. Carved Oak Wainscot Chair, about 1650. Figure 436. Carved Oak Wainscot Chair, about 1650. 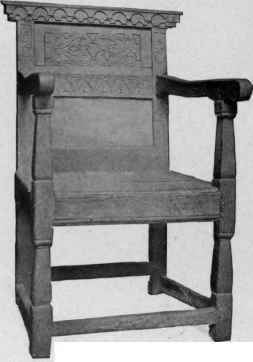 A wainscot chair of American oak in the Bolles Collection is shown in Figure 435. The panel is arched, with a narrow carved palmated design surrounding it. In each spandrel is a carved circle and a small circle is carved in the centre above the arch. The cresting, the lower edge of the back, and the skirt are all cut in the serrated design shown in Figure 432. This chair has been restored with oak of a different grain in order to clearly show the old parts. Figure 436 shows another wainscot chair with rather crude carving. The panel is in the familiar double-foliated scroll found on other oak pieces. The top rail sets within the stile and there is a cresting of two scrolls. The surfaces of the stiles are carved in alternate circles and lozenges, and on the rail under the seat is carved a lunette design. This chair is the property of Mrs. C. S. Merriam, of Meriden, Connecticut. A rather ornate wainscot chair from the Bulkeley Collection is shown in Figure 437. Across the top is a large double scroll. The panel is in a lozenge design with four semicircular projections. Above the panel is carved an entwined lunette design, and the sides of the stile under the top rail are finished with the applied pieces which are missing on the specimens shown in Figures 432 and 433. A very good reeded design finishes the seat rail and is repeated below the top rail. The front legs are rather slender for a wainscot piece, and the turning is of a later period than that on any of the other wainscot pieces shown. Carved Oak Wainscot Chair, 1650-75. Figure 438. 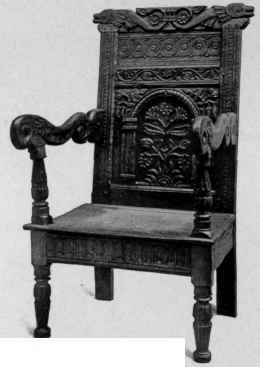 Carved Oak Wainscot Chair, about 1650. Figure 438 shows a wainscot chair in the Bolles Collection which was found at Scituate, Massachusetts. It appears to be made of American oak. The carving, however, is of much better quality than is usually found in this country. The cresting is composed of two grotesque fishes with tails, terminating each in a leaf and a rosette. Below the cresting is a rectangular panel carved in a well-executed guillochc design, and on the rail below the panel is carved a foliated and flower design. The main panel is recessed by an applied arch in the spandrels of which are carved flowers and leaves, and the panel itself has a charming design of flowers and leaves after the manner of some of the chest panels. The arms are in scroll forms and slightly carved. The graceful front legs and supports of the arms are carved in godrooning and fluting. The legs have been partly cut off, judging from the height of the seat, and were probably finished like the legs of the stool shown in Figure 405. The seat rail is ornamented with reeding. Another form of wainscot chair is the chair-table. It has all the characteristics of the wainscot chair except that the back is pivoted and swings forward, resting on the arms, forming a table. They were apparently quite common in this country, and the plainer types are still to be found. We find mentioned in a Salem inventory of 1673 "a chair table 7s 6d"; and again, in 1690, and at Yorktown, Virginia, 1666, "I table chair"; and in 1675, "one new chair table 8s." 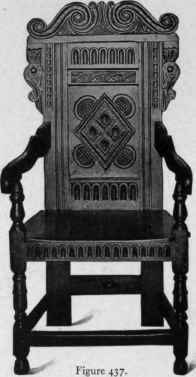 This chair is practically the same as the famous Theodore Hook chair, although it is not carved. Figure 439 shows the finest specimen of a chair-table that has been found in this country. It is in the Bolles Collection. It will be seen that the frame very closely resembles the chairs of the period, except that the rear legs are turned like the front ones instead of being plain. The under sides of the stretchers are serrated and under the seat is a drawer on side runners. The back makes a long rectangular table and the cleats and mouldings on the under side are much better finished than is usual. Figure 440 shows another unusual chair-table in the same collection. The construction is the same but there is no drawer under the seat; instead the skirt is cut in the well-known double cyma curve. The top when down forms a large square table. Figure 439. Oak Wainscot Chair-Table, about 1650. Figure 440. Turned Wainscot Chair-Table, about 1700. Figure 441. Turned Wainscot Chair-Table, 1725-50. 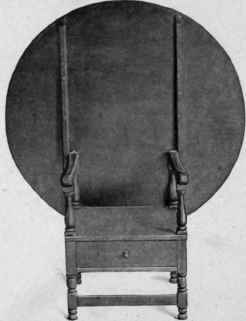 Figure 441 shows a later variety, which is the more common form, with a round top, the chair-seat having a drawer on bottom runners.